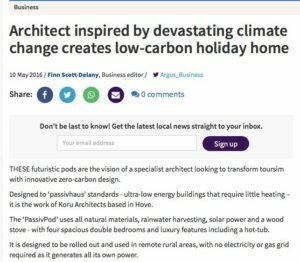 ‘Architect Inspired by Devastating Climate Change Creates Low-Carbon Holiday Home’ in The Argus, May 2016. 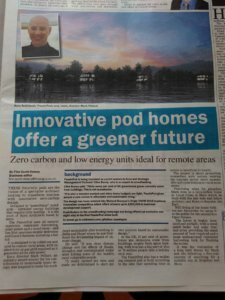 Our local daily newspaper The Argus covered the competition entry of our PassivPod in the business news section of their website and in their print version. The story also touches on our director Mark Pellant’s inspiration for starting the business and why he’s so passionate about sustainable design. Photo of the print version of the same article. You can click here to read the full article online and learn about our motivations for designing PassivPod.